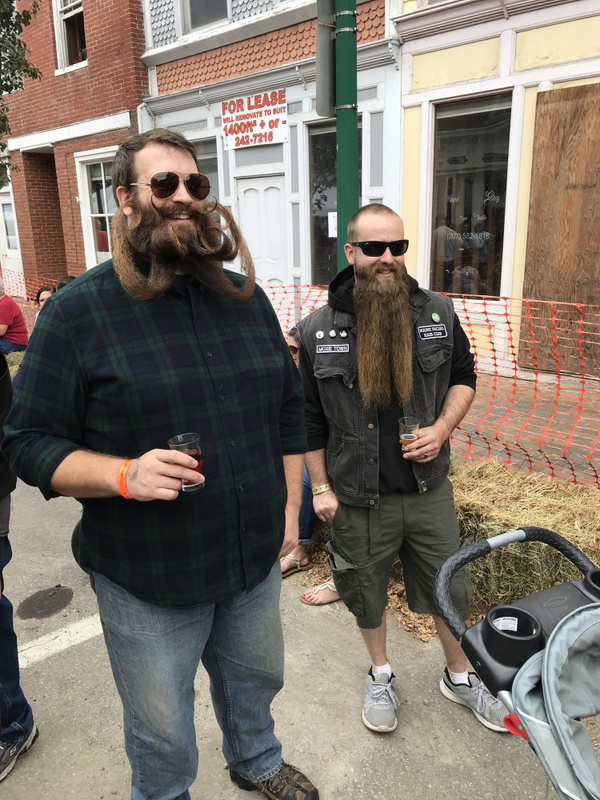 Highlights of the eighth annual Swine & Stein celebration included a beard and mustache contest, live music, food trucks and a dozen craft beers. GARDINER — Bryce Royal hasn’t shaved in more than five years. Throughout the early afternoon, person after person walked up to Royal and asked for a picture, and he was happy to oblige. Diana Twombly, one of the organizers from Gardiner Main Street, said there were about 100 volunteers and they were expecting 1,500 to 2,000 attendees. It’s consistent with the crowds the event has seen in the past few years. Zachary LeClair, of Lisbon Falls, said he’s been growing his beard for about four years. He said it was itchy at the beginning. People come from all around Maine for the Oktoberfest celebration. Joan Sturn and her sister, Beth Wilson, made the drive from Portland while their husbands stayed home and watched their children. Sturn said it’s rare she gets to spend this kind of time with her sister, and they decided Oktoberfest in Gardiner was the perfect event. There was even a group that had driven down from Montreal. Those three couples — all in their 40s — pick a different Oktoberfest celebration to attend in New England and this year, they chose Gardiner. Jean Levesque and his wife, Marie, said they were both looking forward to watching Leon Emery cut up half a pig, and they were also planning to try several Maine beers. The Levesques attended several Oktoberfest celebrations in Boston last year and wanted to try a smaller, more intimate gathering for their 2017 excursion. The sextet rented a Cadillac Escalade and left Montreal on Thursday morning for Waterbury, Vermont, where they toured the Ben & Jerry’s ice cream factory. The group arrived in Portland on Thursday evening, are staying at one of the hotels in the Old Port and plannto have dinner Saturday night in Hallowell. They’ll return to Montreal on Sunday afternoon in time to watch the end of the Montreal Canadiens hockey game. “There’s just something about guys in kilts, really long beards and the calendar saying ‘October’ that makes us smile,” Marie Levesque said. “It’s a fun time, and it’s like an unofficial kickoff of fall.